The 4th of July is time to bring out the stars and stripes, as well as the red, white, and blue. Make the most of this patriotic holiday with these Independence Day-themed appetizers. Your guests will get into into the spirit of America's most patriotic holiday when you serve them fun appetizers with an Americana theme. These crab canapés are the perfect red, white and blue finger foods. Lay the tortilla chips out on a tray. Combine red pepper, crab, mayonnaise, lemon juice, lemon zest, and scallions in a bowl, and mix until combined. 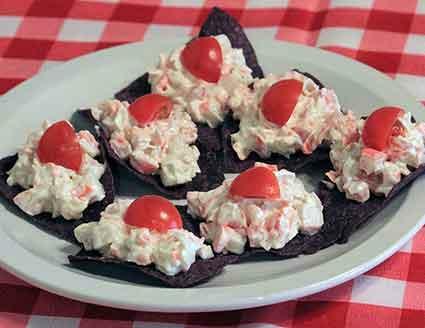 Top tortilla chips with spoonfuls of crab salad. Top each appetizer with a quarter slice of cherry tomato. These red, white, and blue mini pizzas are great right off the grill. Lay out all ingredients before starting. Flour a surface and roll out the pizza dough until it is 1/8 inch thick. Using a cookie cutter or knife, cut the pizza dough into stars and oblong rectangles. Brush both sides of the pizza crust with olive oil. Place the crusts on hot grill. Flip, and top each crust with tomatoes and bleu cheese. Turn down the grill to medium low. Cover and cook until the cheese melts, about 5 minutes. Arrange the pizzas on a rectangular platter in the shape of a flag with stars in the upper left corner and rectangle pizzas placed end to end to make stripes. Potato salad is a classic summer appetizer. Make this one pop for the Fourth of July by using three different colors of baby potatoes. Cherry tomatoes, seeded and halved. Toss the potatoes with 1/4 cup olive oil and fresh thyme. Place them in a single layer in a baking pan, cut side down. Roast until the potatoes are tender, about 20 minutes. Set the potatoes aside to cool. Meanwhile, whisk together the shallot, garlic, lemon juice and zest, red wine vinegar, mustard, and olive oil until well combined to make a vinaigrette. Add the cooled potatoes and red bell pepper to the bowl. Toss with the vinaigrette. Season to taste with sea salt and pepper. Peel clean cabbage leaves from the head and trim to make a small bowl. 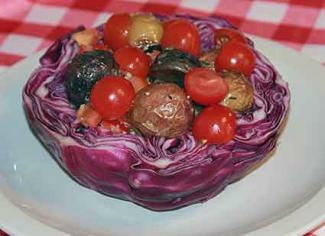 Place small scoops of salad into the cabbage bowls. Pair tasty smoked salmon with a delicious blueberry ketchup and puff pastry stars for an instant Independence Day classic. Make the ketchup ahead of time, and let it cool completely before using. Combine berries, shallot, sugar, vinegar, ginger, lemon juice, salt, and pepper in a medium saucepan over medium-high heat, stirring constantly until sugar dissolves. Reduce heat to medium low and cook, stirring occasionally, until sauce thickens. This will take about 20 to 30 minutes. Remove from heat. Cover and refrigerate for at least four hours or overnight. Preheat oven to 425 degrees. Line two baking pans with parchment paper. Lightly flour your work surface. Roll the puff pastry sheets out slightly into an elongated rectangle, until they're about 1/8 inch thick. Using a cookie cutter or knife, cut the pastry into small star shapes. Place the puff pastry stars on prepared baking pans. Prick each star with a fork several times. Bake in the oven until browned and puffed, about 18 to 25 minutes. Cool the puff pastry stars on a wire rack. 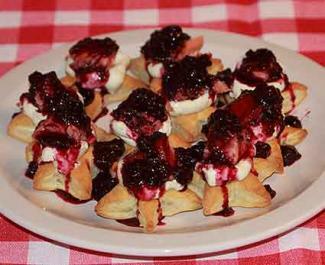 To assemble the dish, top each star with a dollop of crème fraîche, smoked salmon, and blueberry ketchup. These recipes are great starters to a fun meal filled with patriotic recipes and cocktails. By combining good food, great friends, and fireworks, your guests will have a fantastic time on the 4th of July.